After I finished with the Bell Tower and Drum Tower tour, I took a taxi to the Xian Forest of Stone Steles Museum, which was about 5 minute drive from the drum tower. 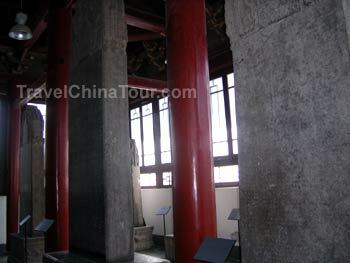 The Xian Stone Tablets Museum contains the largest collection of stone tablets. The museum houses over 3000 stone steles with a history of over 900 years, and these are all treasures of ancient China's calligraphy masterpieces. 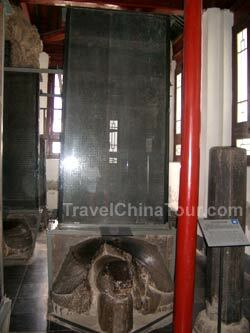 The museum also has some of the best of the Han and Tang Dynasty stone calligraphy carvings, and it also contains the largest stone tablet library of ancient hisotrical records. The Xian Forest of Stone Steles was founded in 1087, and contains various stone tablets dating as far back as the Han Dynasty (206BC). 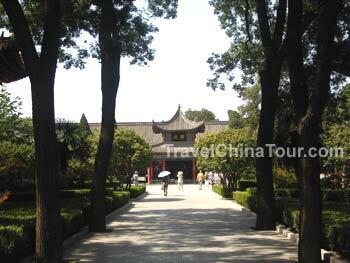 The museum is world famous for preserving ancient Chinese stone tablets which record historical events, and cultural developments within China. Main courtyard after entering the front entrance leading to the Stone Tablet Museum. Altogether, about 650,000 some Chinese characters were inscribed on 114 stone tablets (228 double sided). Now, when I visited, these stone tablets are huge, and place behind protective glass casings. Due to aging and wear and tear, there's typical damage that comes with time, such as chips and cracks. Photo of a section of a large stone tablet. 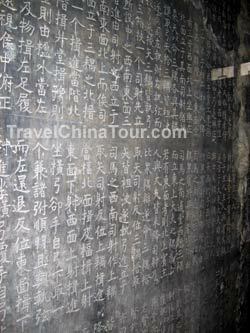 As you can see in the photo above, literally hundreds of thousands Chinese characters are carved into the stone tablet, and if you look closely enough, you'll see a rather large crack in the stone tablet in the top right corner and right side. Although I can manage to read many of the individual characters inscribed, I really have no clue what it's saying. It's like being able to pronounce an english word purely from knowing the alphabet, except having no idea what the word means. :) Within this room, there are information boards that explain in english and chinese what various tablets contain, and highlights their significance. A stone tablet with its base carved in a shape of a turtle. Seal style - on the "stone tablet of the preface to the poem of the Meiyuan Mystical Spring"
Official script shown on the "stone tablet of Cao Quan"
Regular script displayed on "the Stone tablet of Yan Qinli"
Running hand script is shown on tablets such as "stone tablet of Master Monk Hui Jian"
Cursive script on "Huai Su's 1,000 Chinese character stone tablet"
Large stone tablets on display in the third room. More to come about the remaining rooms in the next part.